This is another of the wonderful photos that I scanned this weekend. 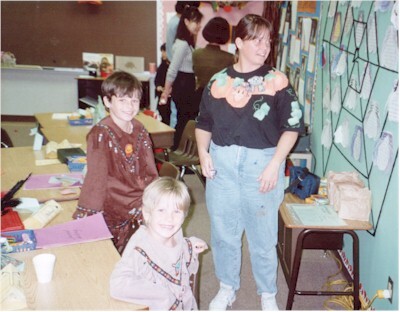 It's Halloween, 1994. The kids both look so happy here. Bayley and I spent a lot of time at the Fiesta de los Penasquitos today. It's a fair over near the shopping center that has occurred on Cinqo de Mayo for the last seven years or so, and the first time that I've attended. We walked over to hear the high school Jazz Band play, then stayed for quite a while talking with friends and people who just wanted to come over and meet Bayley. The most common question: "What kind of dog is that?" Second most common: "Can I pet your dog?" Bayley had a great time, I think. She was very well-behaved and friendly. She even met a few new canine friends and a pot-bellied pig. Bayley really has only been exposed to humans and cats, so she's generally apprehensive and curious around other species.